It will now check and show there is an "Update 2 Available for download"
BUT DO NOT SELECT "Update Now"
4 drwxr-xr-x   23 root     root          4096 Apr 30 19:50 . 4 drwxr-xr-x   23 root     root          4096 Apr 30 19:50 ..
Be warned, the system will reboot once we perform the next step...so make preparations in case you are in the middle of a file copy etc. Thank you very much, finally patched my nas from the stupid heartbleed. 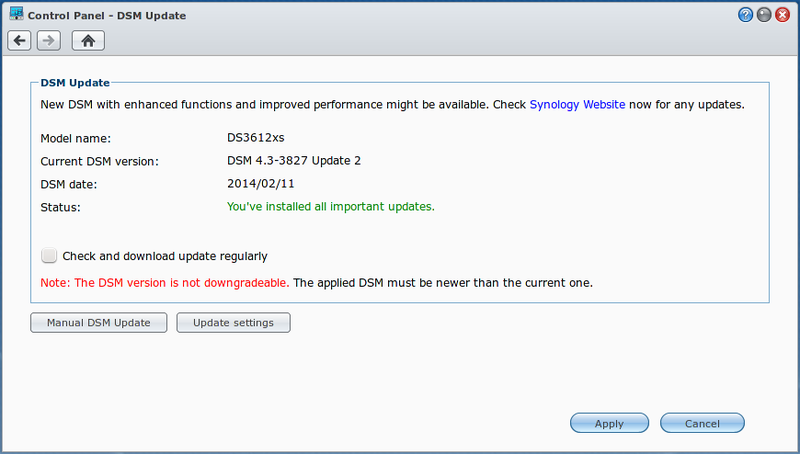 Great, I would like to update it but weirdly my Xpenology says I have the newest DSM version (4.3 Beta 7). Is there some packed update that I can sideload via FTP (I mean pack like beta 7). EDIT: Nevermind it seems it needed some more time cause it just found the update in the morning. Easy as 1-2-3, thanks for putting this up there! The update 2 fails for me, so I dug a little and I would like you to give me some ideas that I have not tried. debsig: Failed verification for /smallupd@te/iptables-1.4.2-bromolow-bin_1.4.2-3827-s1_all.deb. verification on package /smallupd@te/iptables-1.4.2-bromolow-bin_1.4.2-3827-s1_all.deb failed! debsig: Failed verification for /smallupd@te/openssl-1.0.x-bromolow-bin_1.0.1g-3827-s2_all.deb. verification on package /smallupd@te/openssl-1.0.x-bromolow-bin_1.0.1g-3827-s2_all.deb failed! Are you well on being update 2 ? Do you have these files 'secret ring' and 'public ring' ? drwxr-xr-x    5 root     root          4096 May  7 23:59 .
drwxr-xr-x   24 root     root          4096 May  3 13:47 .. Selecting previously unselected package iptables-1.4.2-bromolow-bin. A quick google search leads me to believe that this is a permissions issue. Maybe try to run the update as admin? Also did you run the commands as root? p.s tu peux aussi ouvrir un thread dans la section FR du forum, même si ton anglais n'est pas mauvais à mon avis. I tried with and without homes enabled users but it is similar, although I run the 'sed' command as root. If you sent me the contents of your /root folder do you think it could be work ? Can I update my NAS to Update2 Heartbleed fix directly from beta3 insteal of beta7? if it doesnt list update 2 you can manual the update and ssh just dont click the reboot. So second attempt, and it was the one it was done perfectly ! Hi. i have a question. cant an img be done whit all the uppdates from trantor? for noobs like me? or can samone link to the img i start with and the uppdates in order i have to uppdate? Strange as i thought the beta's only included drivers. Just updated successfully to DSM 4.3-3827 Update 4 running on Trantor's BETA 8 using your method! EDIT: Update 5 is working too!!! Hi guys, unable to get this working, even after following the steps to the letter. I just get a blank box. This method worked for me to go from trantor's beta to 3827 update 5 today. Can you give us more details? Which DSM version are you running? Which boot (Trantor's, Nanoboot, ...) Take a screenshot maybe? We have a new update (Update 6)and works fine with the same instructions. I have the latest update and it's 5.